It's not every day Nature Conservancy of Canada (NCC) staff find themselves face to face with the endangered species they work so diligently to protect. A recent banding adventure by the Burrowing Owl Conservation Society of BC at NCC’s Sage and Sparrow Conservation Area gave NCC staff the chance to witness the ongoing efforts to reintroduce burrowing owls to BC's southern interior. 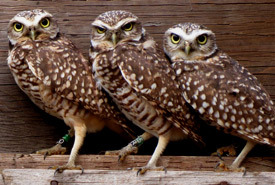 The event turned up no fewer than eight baby burrowing owls between two nests. Banded at three weeks of age, they were at that time just a week away from beginning to fly. Since then, they have started to fly and practise their hunting techniques before they begin to migrate toward California and Mexico in September. Get a peek into the banding process in the video below.